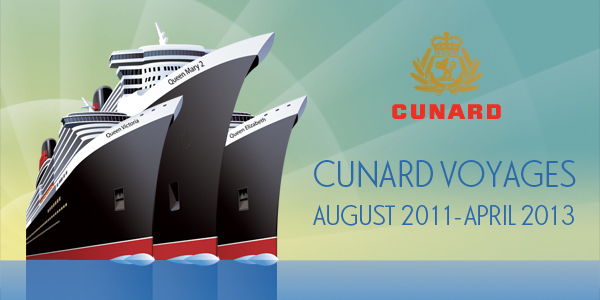 Booking a 2012 Cunard voyage earlier will reward you in lots of different ways, from having the widest selection of staterooms to choose from and early booking benefits. Early Booking Benefits: Bookings made before 31 May 2011 qualify for savings of up to £1,050 per person and complimentary on board spending money of up to $870 per person. In addition, complimentary parking is available on all Southampton round-trip voyages of 5 nights or more and this could be worth £136 on a 14 night voyage. Many voyages are priced “cruise only” but an Optional Holiday Package Add-On is available. This includes International economy flights to/from London, Government fees and taxes, All overseas transfers between airport and ship on dates specified, Embarkation/disembarkation arrangements where necessary and at Cunard’s discretion. Please ask Deluxe Cruises for information and prices. *Terms and Conditions: In addition to the Early Booking Savings, a further 10% saving has been applied to the voyage fare element of 2012 voyages with the exception of 2012 World Voyages and Transatlantic Crossing M202. Complimentary car parking is subject to terms and conditions.